Pirates set to snap up Ndengane? You are here: Home ∼ Pirates set to snap up Ndengane? Bloemfontein Celtic coach Steve Komphela has admitted that he could do nothing to convince Alfred Ndengane to stay at the club as Orlando Pirates look to snap up the defender. 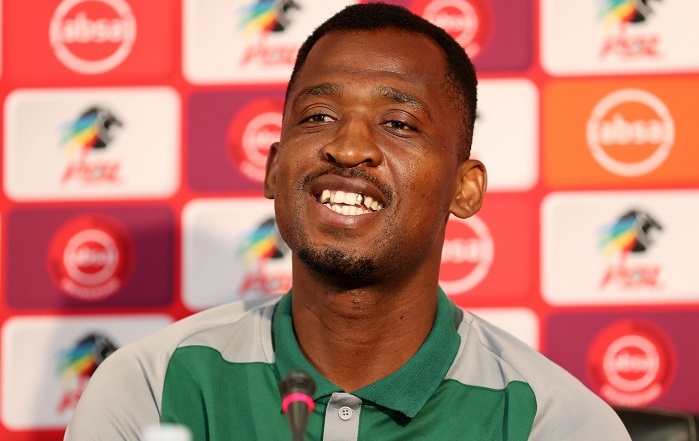 Ndengane, who was fresh off winning the Absa Premiership Player of the Month for August, parted ways with Phunya Sele Sele last week after spending nearly five years at the club. The defender had played a key role in Celtic’s magnificent early season form under Komphela, as Ndengane’s partnership with Lorenzo Gordinho at the centre of defence proved near impenetrable at times. With Ndengane now a free agent, Orlando Pirates are rumoured to be looking to sign him, with the defender spotted by sections of the media at Orlando Stadium for the Buccaneers’ home 0-0 draw against Golden Arrows. The loss of the commanding central defender, however, looks to be a big blow for Komphela and his men and this was evident in the 2-0 loss to Free State Stars last weekend. The former Kaizer Chiefs coach, speaking to Kickoff, admitted that he will have to look for solutions after having his defence dismantled. ‘It’s a blow, but you cannot complain about that because a decision has been made. You just have to look for solutions. ‘You could see how stable we were, very solid [with Ndengane in defence]. We were hard to break. You can’t find the same glue or the same chemistry. It has loosened the chain a bit, but we need to tighten up a bit,’ added Komphela. The Celtics coach also admitted that he could do nothing to stop Ndengane from leaving. ‘It happened too quickly, and I couldn’t just get hold of it. The minute it happens like that, it’s like lightning. You cannot go back and say how did it strike. You just have to look at the danger and disaster and try manage that,’ concluded Komphela.